Astronomers have discovered a giant gathering of galaxies in a very remote part of the universe, thanks to NASA’s Spitzer Space Telescope and Wide-field Infrared Survey Explorer (WISE). The galaxy cluster, located 8.5 billion light-years away, is the most massive structure yet found at such great distances. How did these clusters evolve over time? What did they look like billions of years ago? To answer these questions, astronomers look back in time to our youthful universe. Because light takes time to reach us, we can see very distant objects as they were in the past. For example, we are seeing the newfound galaxy cluster — called Massive Overdense Object (MOO) J1142+1527 — as it existed 8.5 billion years ago, long before Earth formed. As light from remote galaxies makes its way to us, it becomes stretched to longer, infrared wavelengths by the expansion of space. That’s where WISE and Spitzer help out. They then used Spitzer to narrow in on 200 of the most interesting objects, in a project named the “Massive and Distant Clusters of WISE Survey,” or MaDCoWS. Spitzer doesn’t observe the whole sky like WISE, but can see more detail. “It’s the combination of Spitzer and WISE that lets us go from a quarter billion objects down to the most massive galaxy clusters in the sky,” said Anthony Gonzalez of the University of Florida in Gainesville, lead author of a new study published in the Oct. 20 issue of the Astrophysical Journal Letters. The W.M. 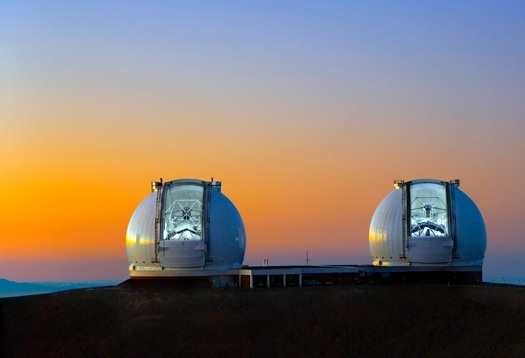 Keck Observatories and Gemini Observatory on Mauna Kea in Hawaii were used to measure the distance to the cluster at 8.5 billion light-years. Using data from the (CARMA) telescopes near Owens Valley in California, the scientists were then able to determine that the cluster’s mass is a quadrillion times that of our sun — making it the most massive known cluster that far back in space and time. MOO J1142+1527 may be one of only a handful of clusters of this heft in the early universe, according to the scientists’ estimates. “Based on our understanding of how galaxy clusters grow from the very beginning of our universe, this cluster should be one of the five most massive in existence at that time,” said co-author Peter Eisenhardt, the project scientist for WISE at NASA’s Jet Propulsion Laboratory in Pasadena, California. “Once we find the most massive clusters, we can start to investigate how galaxies evolved in these extreme environments,” said Gonzalez. JPL managed and operated WISE for NASA’s Science Mission Directorate in Washington. In September 2013, WISE was reactivated, renamed NEOWISE and assigned a new mission to assist NASA’s efforts to identify potentially hazardous near-Earth objects. JPL manages the Spitzer Space Telescope mission for NASA’s Science Mission Directorate, Washington. Science operations and data processing for Spitzer and NEOWISE take place at the Infrared Processing and Analysis Center at the California Institute of Technology in Pasadena. Caltech manages JPL for NASA.